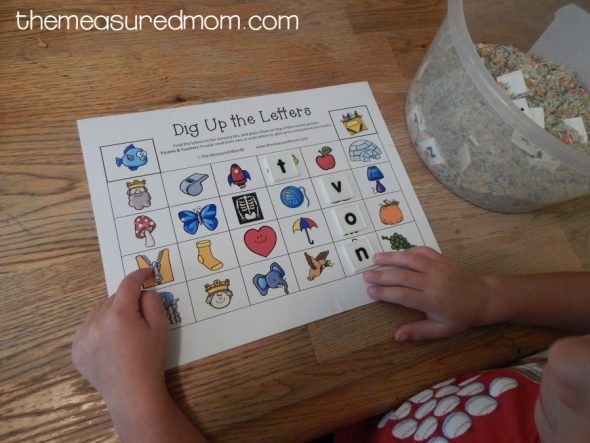 Looking for a fun way to practice alphabet sounds using letter tiles? Try this! Now that we’ve been doing letter of the week for a while now, my Three recognizes all his letters (upper and lowercase) and nearly all their sounds. 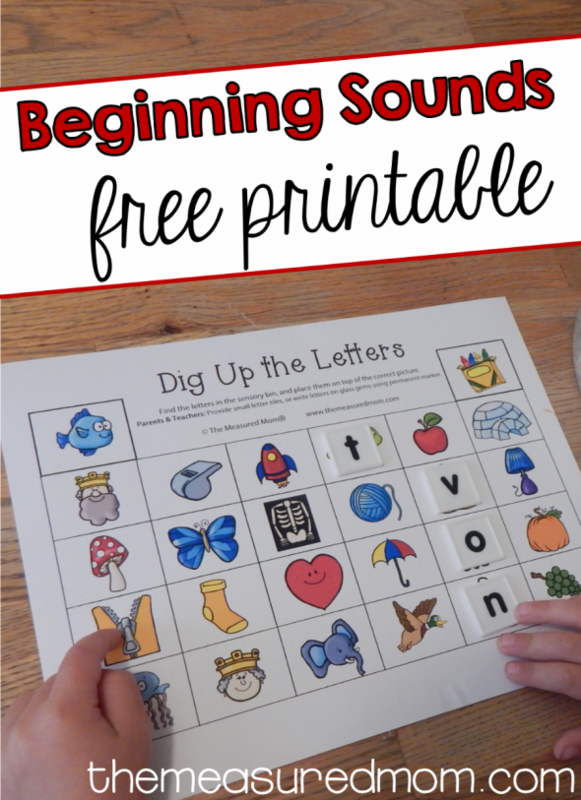 I’ve been doing a variety of beginning sounds activities with him to strengthen his understanding. 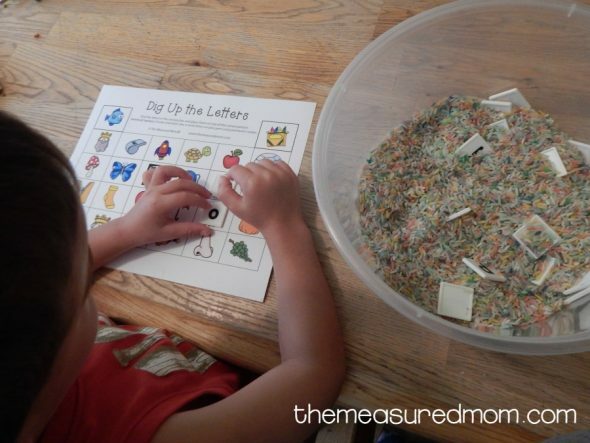 Since my Three likes digging in sensory bins, I buried letter tiles in a box of colored rice. This page was actually quite challenging for my Three, because he was going at it in an inefficient way. He would find a picture, say its name and beginning letter, and then try to dig for it. I tried to show him that it would be easier to grab a letter from the bin and find the picture. 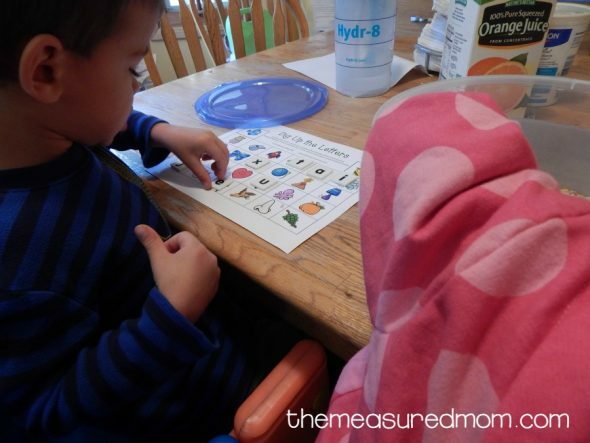 Even hunting for the picture on a big grid is hard for a preschooler who is still learning his sounds. So we did about half the page and put it away for another time. In order to ensure that this was a positive activity for my Three, I was a very active participant. I was finding letters and pictures at the same time that he was. I helped him turn letters the appropriate way when he wasn’t sure what they were meant to be. I gave him clues for where to find a picture. I helped him with a letter’s sound if he was stuck. When he wanted to quit early, I dug out the last few letters and put them in a row in front of him. Together we found their corresponding pictures. An older child or one who’s a little more independent might enjoy doing the entire activity by himself. You can check it when he’s done. In a classroom, two children could work on this together. We hope you get a chance to use it! P.S. 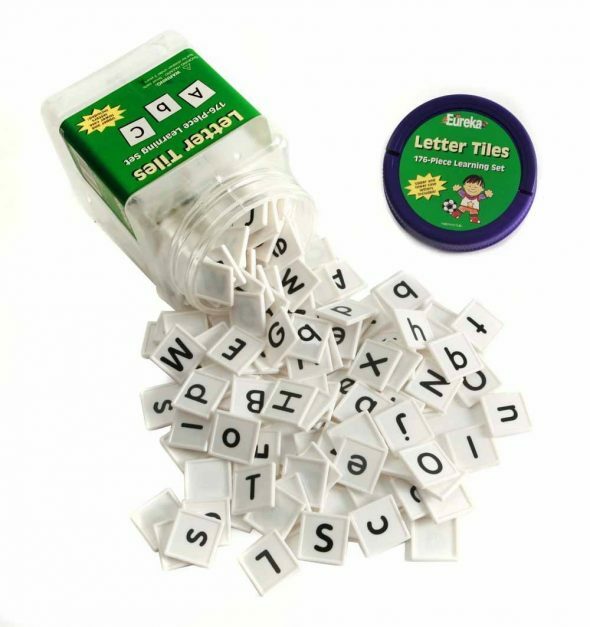 If I were to purchase more letter tiles, I’d get this set. The price is right, and you get both upper and lowercase. P.S. I’ve written a free e-mail series just for you! 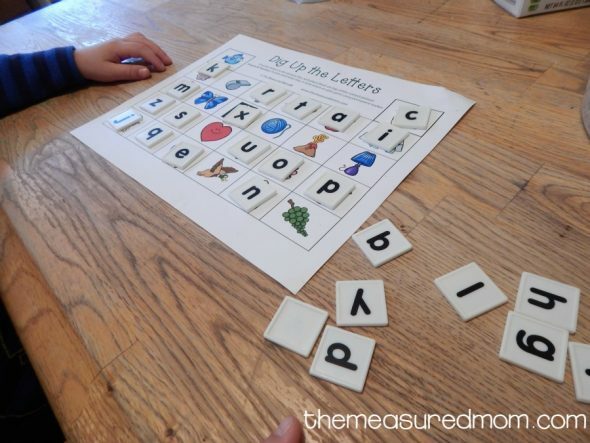 Grab our letter of the week curriculum! For letter tiles, try Scrabble letters off ebay. Lots of cheap choices with free shipping. They have lower and upper case on each tile. These are wonderful and so useful! Thanks for sharing so many of your ideas and hard work! I love the activities you make. Only I have one question: How do you do all of this , with children AND a baby on the way? Thanks so much (again!) for your generosity in sharing these great materials -it is MUCH appreciated! What happens when you right click on the download link, Elizabeth? I am a teacher and I found your ideas and work great! I will try to use this in my classroom activities. But I cant print it its hard to download. Did you click on the box that says “Is the file not downloading?” It’s right under the place to download. One of those tips usually works. I just wanted to say that this is one of my favorite sights for resources for my kindergarten classroom! Thank you so much for sharing your hard work! Thank you so much, April! That’s wonderful to hear! Thank you so much, Keela! Anna, can’t tell you enough how much I love your website, but I am having difficulty downloading the activities. The second step asks me to Add “my templates” but itlists all the things It can: read and change all your data on the websites you visit, replace the page you see when opening a new tab and manage your apps, extensions and themes. These things scare me as it seems like it would be a virus. Can you help me out? Yikes! You definitely shouldn’t see ANYthing like that. Are you clicking on the green box that says “to get your free printable, CLICK HERE”? If you are clicking on something else, that’s an ad. The printable should pop right up when you click on the green box. If you are clicking on the green box and seeing a weird message, please take a screenshot and send it to me: anna(at)themeasuredmom(dot)com.